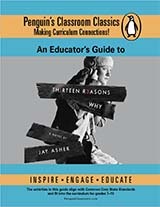 This educator's guide to Thirteen Reasons Why by Jay Asher includes activity and discussion prompts plus classroom lesson plans. Each resource is aligned with Common Core State Standards and includes suggestions for integrating technology. The novel makes an excellent companion to any school or community campaign for National Suicide Prevention Week or Bullying Prevention Month (October).